The roof of your home is the first line of defense against outside elements, so it’s important that it is in working order year-round. Like anything else in your home, your roof requires regular maintenance and inspection. Make it a priority to check the condition of your roof at least once a year. Your roof may require further inspection if your neighborhood experiences severe weather that delivers high winds or hail. 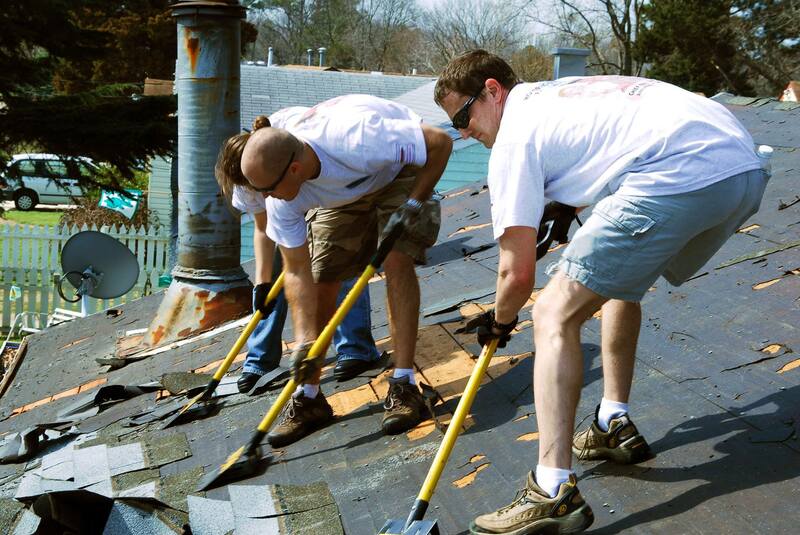 Are you not sure what to look for while you inspect your roof? Read on to learn more about the warning signs of a deteriorating roof. One of the most obvious signs that your roof is in need of repair is if you spot missing or loose shingles. It’s important that shingles are secured to the roof to prevent moisture from finding its way into the house. High winds, flying debris and hail can easily dislodge shingles. Weather conditions can also take a toll on shingles over time. The cycle of freezing and thawing can create damage between shingles. Curling shingles can be caused by a number of things such as poor installation, poor quality material and just natural wear and tear through the years. Much like missing or loose shingles, curling shingles can also leave your roof vulnerable to water damage. If damaged shingles are not addressed in a timely manner, not only can water damage be present, but the structural integrity of your overall roof can be at risk. Damaged flashing can also be a cause for concern when discussing water damage. Like shingles, flashing can become damaged during severe storms or become damaged with age. Flashing protects the surface of the roof in areas that can be vulnerable to leaks. Flashing can be found within roof valleys, the intersection between a dormer wall and the roof surface, chimney and skylight perimeters. Flashing is typically made out of rubber, plastic or a rust-resistant metal. Unfortunately, not every issue is weather or age related. Sometimes damage or a shorter lifespan can be caused by poor installation. A few ways to spot poor craftsmanship includes excessive patching, shingles that do not fit properly or multiple layers of shingles. It used to be a common practice to install new shingles over the old ones to save time and money. However, this style of installation is no longer encouraged and can potentially void the warranty. If you discover that your roof is in need of some TLC, our team at Exterior Remodel and Design are here to help! Our experienced roofers will install, replace, and repair any type of roofing you may have. Exterior Remodel & Design has become a well-trusted name when it comes to roofing in Omaha. We are willing to work with our customers and always take pride in doing a job the right way. Call Exterior Remodel and Design Roofing today to get a fast, free estimate from the most trusted roofers in Omaha. As Omaha’s most trusted roofing contractors, you can count on us for craftsmanship unmatched by other roofing companies in the area. Contact our team today!